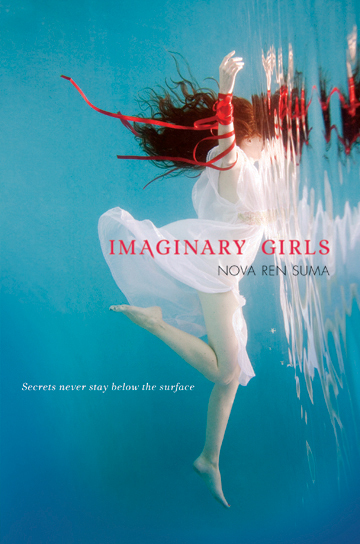 Book Review: Imaginary Girls by Nova Ren Suma - fairy skeletons. So I was in the YA section of my local library, right? And I decide to check out this shelf that I've never really looked at before. And there it was. I'm just that kind of weird person who judges books by their covers, and this color scheme was absolutely brilliant, so I picked it up and took it home to read. This was one of those chilling, creepy but still really good books. Definitely in the same category as Butterfly by Sonya Hartnett (my review for that is here: http://lifeisinexpressible.blogspot.com/2013/01/book-review-butterfly-by-sonya-hartnett.html). Ruby definitely caught my attention from the very first page. This is a character like no other. She had undeniable flair and a mysterious, irrational logic that made me remember her. Throughout the book, Chloe described her with such reverence that the reader was immediately pulled into Ruby's distinctly unsettling spell. I don't know if this was just me, but I had trouble figuring out what was going on, which, interestingly, made me want to read through to the end even more. The enthralling combination of elements (yes, I just used the word enthralling) caught me by the throat and wouldn't let me go until I finished. Chloe was, against most odds, a really likable character. I admired the way she looked at her world, although she didn't actually seem especially strong or spunky or introverted or anything. She was just very normal. I would definitely recommend this book to those who like a mystery and some suspense, as well as fiery, unforgettable characters. Nova Ren Suma's new book, 17 & Gone, might be worth checking out as well.